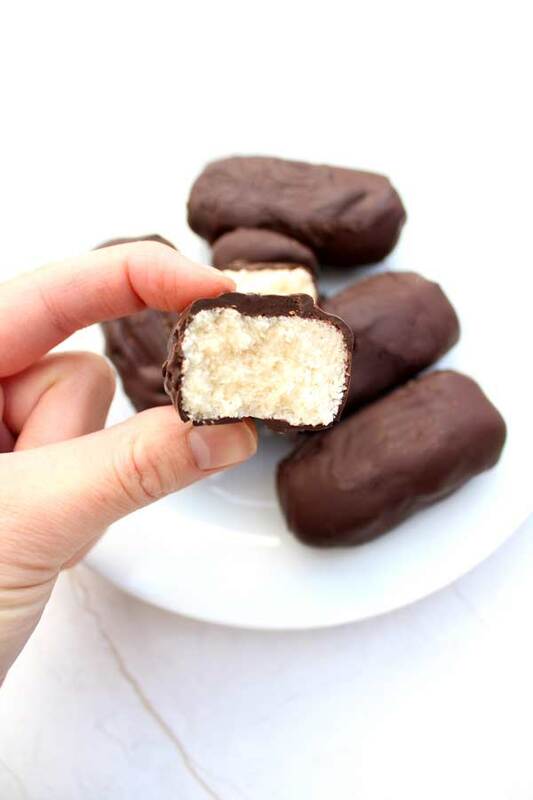 These vegan chocolate coconut bars taste just like the classic Bounty bar! But these have some added benefits! Compared to the original, they are very low carb and low sugar. PLUS they’re also filled with nutritious coconut fats to keep you full and satiated. They contain just a few ingredients and require no baking! Before going vegan, my greatest vice was chocolate. Hot chocolate, brownies, puddings, cakes… If it had chocolate in it, I was eating it. But most of all, I love chocolate bars. I couldn’t imagine life without the likes of Snickers, Mars bars or Bounty bars. I’m not exaggerating when I say there was a point in my life where I ate an average of 4 full-sized chocolate bars a day! I remember offering one of my school teachers a Snickers and when she replied “no thanks, I already ate some chocolate today”, I spent the rest of the day confused as to why anyone would limit themselves to one a day. Even though I’ve grown up and become a little more health conscious, my chocolate addiction remains. In honour of my love for chocolate, I’m sharing my recipe for my vegan chocolate coconut bars. But they’re not just any chocolate coconut bars… They’re low carb, vegan chocolate coconut bars! And they taste just like my favourite childhood treat, Bounty bars. 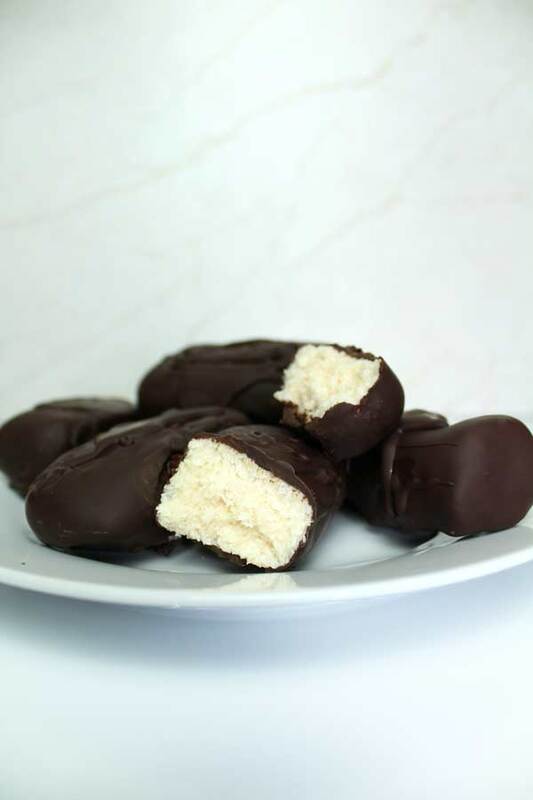 I first created these vegan Bounty bars a few years ago. Before I went fully vegan, I tried out the classic “dairy-free” diet. I missed sweets and chocolate terribly at first but I soon learned that there are no-dairy alternatives to everything, including chocolate. This was before veganism really took off, so I wasn’t able to go to any old store and pick up dairy-free chocolate bars. So I decided I’d try to make my own. And it turns out it was way easier than anticipated! I whacked together some dark chocolate along with a few ingredients I had in my cupboard at the time. I didn’t really know what I was doing, except hoping the result would be tasty and somewhat resemble my beloved Bounty. Luckily, it was a success. And although I didn’t realise it at the time, my dairy-free Bounty bars were totally vegan-friendly! I used fine grade for this recipe. If you only have the regular kind, you can blend it first or just adjust the amount of liquid to form a patty consistency. To make things easier for yourself, be sure that your coconut oil is not cold. You don’t want it to be runny, but it should be semi-solid and easy to scoop. Light coconut milk or full-fat. It doesn’t make a difference so it’s up to you. I used this as an alternative to refined sugar. Agave nectar is more gentle on blood sugar, preventing those sugar crashes that I know all too well. This is totally optional but adds a nice additional flavour. I used dark chocolate as a cheap alternative to vegan milk chocolate, which can be slightly on the pricier side. Most dark chocolate is vegan but be sure to double check. Whether you’re cutting out animal products altogether, going dairy-free, starting a low-carb diet or just simply chocolate mad, these vegan chocolate coconut bars are for you! If you like this recipe, let me know! And if you make them, tag me on Instagram– I’d love to see! 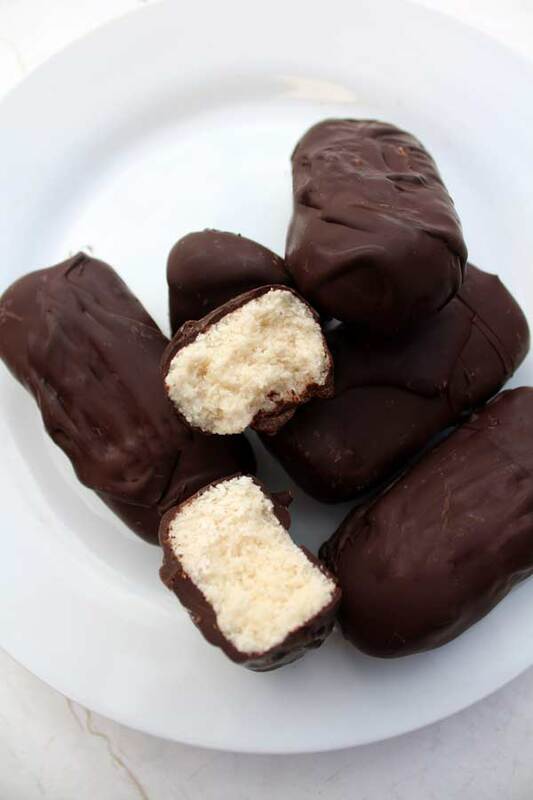 A vegan remake of the classic, coconut chocolate Bounty bars. No bake, gluten free, low carb and refined sugar free! Mix all ingredients except the chocolate in a bowl. Use your hands to form 6 small patties. Shape the patties into bars and freeze for 15 minutes. Melt the chocolate over a low heat and allow it to cool for a few minutes. Dip the coconut bars into the chocolate, one at a time, and place on a cooling rack (make sure there's parchment paper underneath to catch any mess). Refrigerate the bars for 1 hour or freeze for 15 minutes to set the chocolate. Enjoy immediately or store in the fridge for up to 7 days.